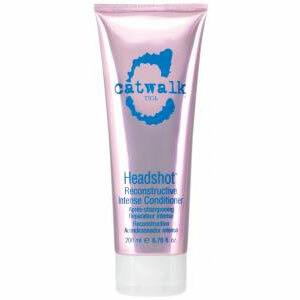 Get ready for your close up with Tigi Catwalk Headshot Reconstructive Intense Conditioner! This intensely lightweight conditioner targets areas most in need of moisture and repair, while taming flyaway�s to leave you with silky soft, shiny hair. This effective conditioner from Tigi Catwalk works to keep your hair strong without weighing it down, helping to prevent breakage while detangling and smoothing frizz. Safe for use on colour treated hair, Headshot Reconstructive Intense Conditioner will soften and smooth your hair leaving you with a beautifully shiny finish.